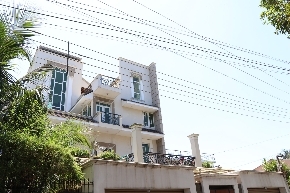 10 YEARS OLD BUILT HOUSE WITH FOLLOWING FACILITIES G 2 STOREY MODERN HOUSE AND THE ROOFTOP .2 MASTER BEDROOMS WITH ATTACHED BATHROOM- 2 BEDROOMS WITH 1 SHARED BATHROOMS ALL IN THE FIRST FLOOR. The property resides in a safe and quiet residential neighborhood. 1 BEDROOM WITH DEDICATED BATHROOM IN GROUND FLOOR. 2 SERVANT ROOMS WITH ATTACHED BATHROOM FACILITIES 2 GARAGE FOR TWO VEHICLES PARKING FACILITIES. SEMI SOLAR PANELED ELECTRICITY SUPPLIES. 14 PERCHES HOUSE BUILT IN WITH GARAGE. WE REQUEST ONLY SERIOUS BUYERS TO CONTACT US SINCE THE PROPERTY VALUE IS VERY HIGHLY COMPETITIVE.